To investigate the impact of different 75 g glucose tolerance test (OGTT) target ranges within normal limits on neonatal outcomes, thus to investigate the validity of 75 g OGTT thresholds. The normal 1-hour and 2-hour ranges of 75 g OGTT levels of 110 pregnant women with no gestational diabetes mellitus (GDM) were further divided into three different sub-groups; for the 1 hour as group 1 (<120 mg/dL), group 2 (120-140 mg/dL), group 3 (>140 mg/dL) and for the 2 hour as group 1 (<120 mg/dL), group 2 (120-135 mg/dL), and group 3 (>135 mg/dL). For the 1-hour results, there was no statistically significant difference between groups in terms of age, body mass index, multiparity, neonatal hypoglycemia, hyperbilirubinemia, neonatal intensive care unit admission, birth weight, and LGT rates; however, the rate of small-for-gestational-age (SGA) infants was significantly higher in group 2 compared with those in group 3. For the 2-hour results, statistically similar results were found between the groups. A 2-hour 75 g OGTT has reliable threshold values for GDM screening. However, because there are still adverse neonatal outcomes in women with OGTT results below the current thresholds and the number of SGA fetuses is higher in the glucose range 120-140 mg/dL of the first hour, the validity of the 75 g OGTT thresholds still needs further investigation. PRECIS: A 2-hour 75 g glucose tolerance test has reliable threshold values for gestational diabetes mellitus screening. However, the validity of the 75 g glucose tolerance test thresholds still needs further investigation. Gestational diabetes, which affects 3% to 6% of all pregnancies, is an important issue that should be handled with specific treatment in addition to routine antenatal care to reduce the risks of maternal and perinatal morbidity(1). It has been suggested that risks for adverse outcomes differ according to the single or combined thresholds selected(2). The hyperglycemia and adverse pregnancy outcome (HAPO) study, pointed out the continuously increased risk between maternal glucose levels and adverse pregnancy outcomes even within ranges previously considered to be normal for pregnancy(3). This study was the cornerstone for the diagnosis of gestational diabetes mellitus (GDM), identified using the 75 g oral glucose tolerance test (OGTT) when any of the following plasma glucose values are exceeded: fasting, ≥5.1 mmol/L (92 mg/dL); 1 h, ≥10 mmol/L (180 mg/dL); and 2 h, ≥8.5 mmol/L (153 mg/dL)(4). These cut-offs recommended by the International Association of the Diabetes and Pregnancy Study Groups (IADPSG)(5), have been adopted by the World Health Organization (WHO)(6) and the American Diabetes Association (ADA)(4). As a result of new diagnostic criteria, the increase in the incidence of GDM and use of treatment modalities will be inevitable; however, considering the increasing rates of obesity and diabetes globally, the changes are updated, and recommended to reduce adverse outcomes(4,5,7). On the contrary, in 2015, the National Institute for Health and Care Excellence (NICE) opted for a higher fasting glucose threshold [fasting ≥5.6 mmol/L (≥101 mg/dL), and/or 2 h ≥7.8 mmol/L (≥140 mg/dL)](8). The objective of this study was to investigate the validity of 75 g OGTT thresholds by evaluating the impact of different 75 g OGTT target ranges within normal limits on neonatal outcomes because the diagnostic dilemma on the most appropriate test for GDM and its thresholds is still ongoing. This is a cross-sectional study of 110 consecutive pregnant women who attended our outpatient antenatal clinic and were diagnosed as having no GDM using the 75 g OGTT at 24-28 weeks of gestation. A 2 hour 75 g OGTT is performed for screening GDM at 24-28 weeks of gestation as a standard obstetric practice at our institution. The study protocol was approved by the Ethics Committee of Lütfi Kırdar Kartal Training and Research Hospital (89513307/1009/372). Written informed consent was obtained from all subjects before the study. The diagnosis of the GDM was made according to the ADA/IADPSG criteria, when any of the following plasma glucose values were exceeded: fasting, ≥92 mg/dL; 1 h, ≥180 mg/dL; 2 h, ≥153 mg/dL(4,5). The exclusion criteria included women with GDM, pre-gestational diabetes mellitus (GDM), hypertension, multiple pregnancies, and fetal anomalies. The normal 1 h and 2 h ranges of 75 g OGTT levels of 110 pregnant women were further divided into three different sub-groups; for the 1 h as group 1 (<120 mg/dL), group 2 (120-140 mg/dL), group 3 (>140 mg/dL), and for the 2 h as group 1 (<120 mg/dL), group 2 (120-135 mg/dL), and group 3 (>135 mg/dL). Neonatal outcomes were compared between these new range groups. Neonatal hypoglycemia, hyperbilirubinemia, intensive care unit admission, large-for-gestational-age (LGA) and small-for-gestational-age (SGA) newborns were considered as adverse outcomes. The presence of one or more adverse outcome was determined as an abnormal result. All data were analyzed using SPSS Statistics for Windows, Version 22 (IBM Corp, Armonk, NY) and p values <0.05 were considered to be statistically significant. Continuous variables are presented as mean ± standard deviation and categorical variables as numbers and percentages. For the analysis of qualitative data, the chi-square test was used. For the analysis of quantitative data, One-Way ANOVA and Kruskal-Wallis tests were used. One hundred ten pregnant women without GDM were enrolled in the study. 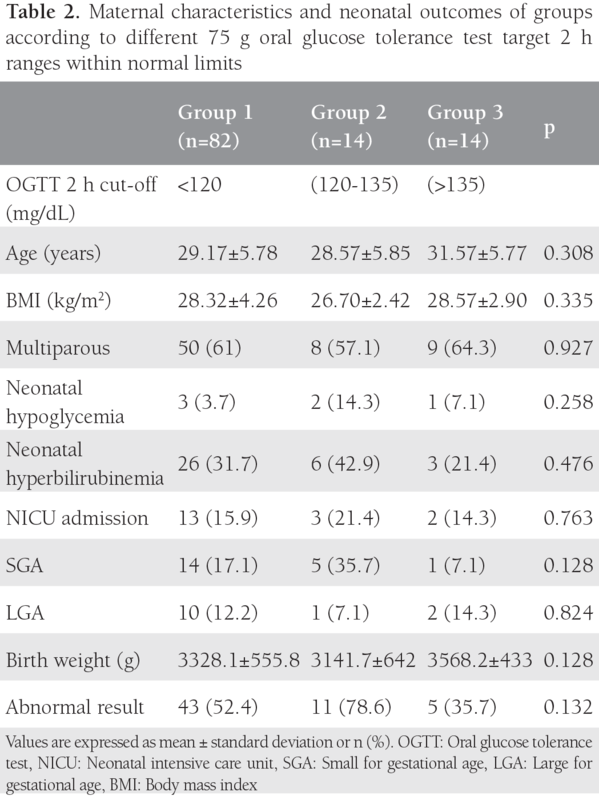 The women were further divided into subgroups according to different ranges of normal 75 g OGTT results to compare neonatal outcomes. The number and percentage of the subjects were 50 (45.5%), 32 (29%) and 28 (25.5%) for the first hour (Table 1), and 82 (74.5%), 14 (12.7%), and 14 (12.7%) (Table 2) for the second hour, for groups 1-3, respectively. For the 1 h results, there was no statistically significant difference between the groups in terms of age, body mass index (BMI), multiparity, neonatal hypoglycemia, hyperbilirubinemia, intensive care unit admission, birth weight, abnormal results, and LGA rates; however, the rate of SGA infants was statistically significantly higher in group 2 compared with group 3 (Table 1). For the 2 h results, statistically similar results were found between the groups (p>0.05) (Table 2). The limitation of the study is its small sample size. The validity of the 75 g OGTT thresholds still needs to be investigated and verified by large studies. This study demonstrates that the 75 g OGTT (IADPSG/ADA) has reliable threshold values for GDM screening as the neonatal outcomes do not differ between the low normal and high normal levels of the first and second-hour test results, and provides evidence that there are still adverse neonatal outcomes in women with OGTT results below the current thresholds. The study also reports a higher number of SGA in the glucose range 120-140 mg/dL of the first hour, which needs further evaluation. As a result, the validity of the 75 g OGTT thresholds still needs to be investigated and verified by large studies. Surgical and Medical Practices: S.S., Concept: Z.M.P., Design: Z.M.P., Data Collection or Processing: S.S., Analysis or Interpretation: G.A.İ., Literature Search: S.S., G.A.İ., Writing: G.A.İ. 1. Alwan N, Tuffnell DJ, West J. Treatments for gestational diabetes. The Cochrane Database of Systematic Reviews 2009;(3):CD003395. 2. Black MH, Sacks DA, Xiang AH, Lawrence JM. Clinical outcomes of pregnancies complicated by mild gestational diabetes mellitus differ by combinations of abnormal oral glucose tolerance test values. Diabetes Care 2010;33:2524-30. 3. HAPO Study Cooperative Research Group, Metzger BE, Lowe LP, Dyer AR, Trimble ER, Chaovarindr U, Coustan DR, et al. Hyperglycemia and adverse pregnancy outcomes. N Engl J Med 2008;358:1991-2002. 4. American Diabetes Association (ADA). Diagnosis and classification of diabetes mellitus. Diabetes Care 2011;34 Suppl 1:S62-9. 5. Metzger BE, Gabbe SG, Persson B, Buchanan TA, Catalano PA, Damm P, et al. International association of diabetes and pregnancy study groups recommendations on the diagnosis and classification of hyperglycemia in pregnancy.International Association of Diabetes and Pregnancy Study Groups Consensus Panel. Diabetes Care 2010;33:676-82. 6. Diagnostic criteria and classification of hyperglycaemia first detected in pregnancy: a World Health Organization Guideline. World Health Organization (WHO). Diabetes Res Clin Pract 2014;103:341-63. 7. American Diabetes Association (ADA). Classification and Diagnosis of Diabetes. Diabetes Care 2016;39 Suppl 1:S13-22. 8. National Institute for Health and Care Excellence (NICE). Diabetes in pregnancy: management of diabetes and its complications from preconception to the postnatal period. Clinical guideline NG3.2015. Available from www.nice.org.uk/ guidance/ ng3/ resources/ diabetes-in-pregnancy-management-of-diabetes-and-its-complications-from-preconception-to-the-postnatal-period-51038446021. 9. Ovesen PG, Jensen DM, Damm P, Rasmussen S, Kesmodel US. Maternal and neonatal outcomes in pregnancies complicated by gestational diabetes. a nation-wide study. J Matern Fetal Neonatal Med 2015;28:1720-4. 10. Laafira A, White SW, Griffin CJ, Graham D. Impact of the new IADPSG gestational diabetes diagnostic criteria on pregnancy outcomes in Western Australia. Aust N Z J Obstet Gynaecol 2016;56:36-41. 11. Martino J, Sebert S, Segura MT, García-Valdés L, Florido J, Padilla MC, et al. Maternal Body Weight and Gestational Diabetes Differentially Influence Placental and Pregnancy Outcomes. J Clin Endocrinol Metab 2016;101:59-68. 12. Peixoto AB, Caldas TM, Santos RO, Lopes KS, Martins WP, Araujo Júnior E. The impact of gestational diabetes and hypothyroidism on the third-trimester ultrasound parameters and in adverse perinatal outcomes: a retrospective cohort study. J Matern Fetal Neonatal Med 2016;29:3416-20. 13. Wu ET, Nien FJ, Kuo CH, Chen SC, Chen KY, Chuang LM, et al. Diagnosis of more gestational diabetes lead to better pregnancy outcomes: Comparing the International Association of the Diabetes and Pregnancy Study Group criteria, and the Carpenter and Coustan criteria. J Diabetes Investig 2016;7:121-6. 14. O’sullıvan JB, Mahan CM. Criteria for the oral glucose tolerance test in pregnancy. Diabetes 1964;13:278-85. 15. American College of Obstetricians and Gynecologists (ACOG). Practice Bulletin No. 137: Gestational diabetes mellitus. Obstetrics and Gynecology 2013;122:406-16. 16. March MI, Modest AM, Ralston SJ, Hacker MR, Gupta M, Brown FM. The effect of adopting the IADPSG screening guidelines on the risk profile and outcomes of the gestational diabetes population. J Matern Fetal Neonatal Med 2016;29:1141-5. 17. Crowther CA, Hiller JE, Moss JR, McPhee AJ, Jeffries WS, Robinson JS; Australian Carbohydrate Intolerance Study in Pregnant Women (ACHOIS) Trial Group. Effect of treatment of gestational diabetes mellitus on pregnancy outcomes. N Engl J Med 2005;352:2477-86. Epub 2005 Jun 12. 18. Moss JR, Crowther CA, Hiller JE, Willson KJ, Robinson JS; Australian Carbohydrate Intolerance Study in Pregnant Women Group. Costs and consequences of treatment for mild gestational diabetes mellitus - evaluation from the ACHOIS randomised trial. BMC Pregnancy Childbirth 2007;7:27. 19. Farrar D, Fairley L, Santorelli G, Tuffnell D, Sheldon TA, Wright J, et al. Association between hyperglycaemia and adverse perinatal outcomes in south Asian and white British women: analysis of data from the Born in Bradford cohort. Lancet Diabetes Endocrinol 2015;3:795-804. 20. Meek CL, Lewis HB, Patient C, Murphy HR, Simmons D. Diagnosis of gestational diabetes mellitus: falling through the net. Diabetologia 2015;58:2003-12.